The Trek Connect E-Commerce service allows customers to order online and have their order shipped either directly to them or to their local dealer. Trek handles all taxes and payment processing. This service is provided at no charge to dealers. When a customer purchases a bike through the Trek Connect E-Commerce service, your store receives an email containing the customer and bike details. Record a work order to track the build and delivery. For details on the Trek Connect e-commerce platform, see the Dexter article. 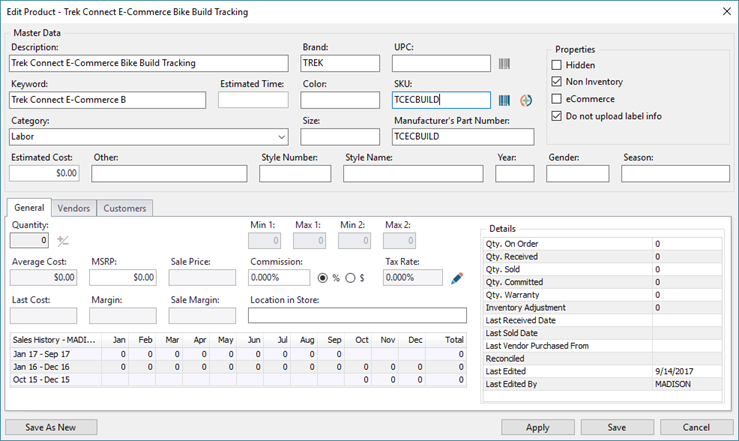 Download and import the Trek Bicycle Corporation Trek Connect E-Commerce spreadsheet (available on www.ascendrms.com) under vendor Trek Bicycle Corporation. a. Check Do not upload label information. Sherpa Tip: Assigning these SKUs to the Labor category affects Labor metrics in Ascend Analytics. When the MSRP Is Not Greater Than Cost prompt displays, click Yes. (optional) Print labels to keep at all registers for employees to scan easily. Multi-store retailers: Fill out your store profile for every location. In the Dealer Information section, click Edit (pencil icon). a. Dealer Name: Enter the name you wish to be displayed to customers. b. Telephone: Enter your store's primary phone number. c. E-Mail: Enter the email address for customers to contact the store. d. Web Address: Enter your website address. e. Delivery Radius (Miles): Enter the maximum distance your store is willing to travel to deliver assembled bikes to customers. Sherpa Tip: If your store does not wish to provide this service, enter 0. From the Timezone for this location drop-down menu, select the appropriate time zone. (QuickBooks® Users) If you use the Trek invoice download service, notify accounting@ascendrms.com of the account assignments you wish to use for service commission credits. 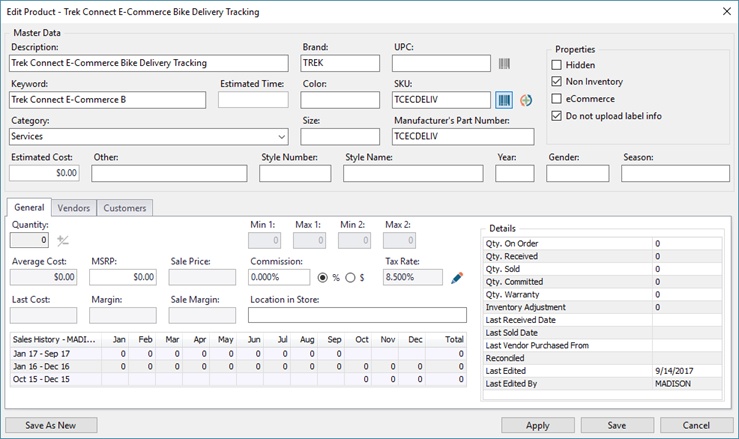 Create a bike build work order for the customer; see How do I assemble a product for a customer? for details. Scan or enter the Trek Connect E-Commerce Bike Build Tracking SKU. Complete the work order as normal; see How do I process a customer’s repair? for details. Scan or enter the Trek Connect E-Commerce Bike Delivery Tracking SKU.Sherpa Tip: Do not close (finish) the work order until the bike is delivered. When the bike is delivered, process a $0 cash payment.